In small bowl, mix mayonnaise, vinegar, lemon juice, black pepper and red pepper with wire whisk. 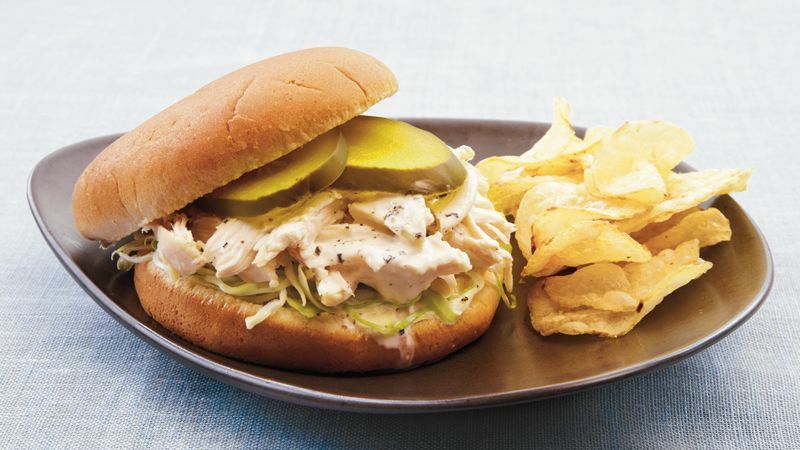 On each bottom, place 1/3 cup coleslaw, 1/2 cup chicken, 2 tablespoons white barbecue sauce and 2 pickle slices; cover with bun tops. Refrigerate remaining white barbecue sauce in covered container up to 1 week. White Barbecue Sauce, widely used in Alabama-style barbecue, is known for its vinegary taste and use of mayonnaise as its base, rather than the usual tomato sauce. To make the sauce ahead of time, combine all of the ingredients, store the sauce in the refrigerator, and bring it to room temperature before serving.